Greetings and welcome to the Friday Fix! Are you like me and spent the entire week confused about what day it was because Monday was Labor Day holiday? Oh…just me? That’s okay. Well, at least I figured out that it’s Friday, right? (How else would you get your Fix…I mean before happy hour? 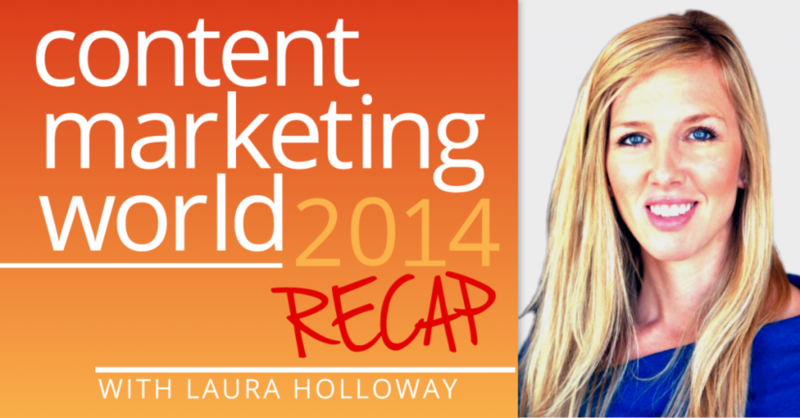 (wink)) This week, we have highlights from Content Marketing World 2015 (#CMWorld), insight on visual marketing, and some really great advice on visual storytelling. All in all, it’s been a pretty darn good week. So, kick back, relax, and Fix your Friday! In case the CMW 2015 theme wasn’t a big enough cue (Bright Lights, Big Content) or the volume of posts we’ve shared in the past few fixes on visuals didn’t convince you, then check out Jack Loechner’s read seal the deal; visuals tell stories and are of tremendous importance in any successful content marketing strategy these days. Importantly, as Jack’s statistic-laden article points out, it’s not just any visual that takes the cake; it’s photography and video (especially video) that are going to increase and that need to be part of how you tell stories. Here’s a fun fact from Diane Primo’s article that gives me instant arthritis: “Video is worth 1.8 million words per minute of text.” Holy clicking keyboards, Batman, that’s a lot of words; I can’t imagine jamming out 1.8 millions words let alone for the sake of covering the space of a minute. Not only does video cover a lot more territory in less time, it also promotes engagement. The power of its outreach and ability to relate stories are impossible to ignore. I agree with Taylor Mallory Holland; the things I best remember and feel most connected to are the things that seem to “get me” or that I relate to. Off the top of my head, I think of those Luvs diaper commercials where the mom compulsively sterilizes everything with first baby and then passes off second baby to a grease-covered mechanic. It’s hilarious, and it’s so true. It’s not the most heart-wrenching story out there, but it’s subtle and relatable. It’s not about the diaper; it’s about the story. The message of “we ‘get’ you” is only one of Taylor’s five subtle marketing messages highlighted in this article; check it out and learn how to make friends with emotional storytelling. I feel this article ties in well with Taylor Mallory Holland. In this case, Braden Becker tells the true story of how to tell a real story in content creation. His three key tips? Grow with the audience; forget the product; and write with knowledge. In other words, you’re not just writing about something the way you think a user would want to read about it (in this case, some snazzy Vans); you’re writing about it from the passionate POV of a user. There’s a little more to it in Braden’s article, which is a definitely must-read for all storytellers. Sorry, Cookie Monster, but none of the Cs in Vala Afshar’s article are for cookie; instead, the five 5 Cs of content marketing focus on convergence instead of consumption (or at least, it’s a different kind of consumption). The 5 Cs are: consumer, context, content, commerce, and convergence. The idea is that if you focus on these 5 Cs of digital marketing, success (regardless of industry will thus follow). Vala explains the formula with details and with colorful diagrams, as well as how each C works together for your benefit and to keep you relevant. Log Brendan James’ piece under “the more you know” because this is important information. So, native advertising is cheesing a lot of people off “despite the headlines” as Brendan points out. Also, he says that native ads don’t even prove to be that effective. I can understand. It reminds me of when people on my Facebook page angrily share an article on my Facebook page about Obama using $10 billion in taxpayer dollars to take a luxury vacation on Mars (and then other people like it and chime in). Everyone feels like a real a-hat when they realize it’s fake (in case the “luxury resort on Mars” part wasn’t a key tip off). So, what’s to be done? The thing is, I’ve polled my Millennial college students and like the majority of respondents to a poll in this article, they don’t trust sponsored media. So, what to do? Read this Brendan’s piece to see what he has to say. As important as planning is in content marketing, it’s equally important to take risks. Risks are not only fun (who doesn’t love a little adrenaline rush), but their payoff can be stellar. You won’t always take your content marketing on a meteoric journey to success with risks, but at least you tried; more importantly, you learned something (I hope). So, take it from one of my favorite content marketing writers, Jayson DeMers, and see how he suggests to roll the dice and when to go all in. Okay, so I didn’t know John Cleese was going to be at CMW 2015. I’m immediately more jealous of whoever got to hear him speak; he’s not only British, he’s brilliant. Anyway, I digress. Janet H. Cho’s article brings you all of the stats and details and what-the-what from #CMWorld 2015. As a bonus, you learn what Joe Pulizzi’s favorite color is (try to guess before you read the article!). Like a Monday morning without coffee, the cold hard reality of pioneering a content marketing campaign is that it takes work, persistence, and effort. After all, if it were easy, wouldn’t everyone be knocking their content marketing out of the park? Think of this post of tips on executing a successful content marketing campaign as that cup of coffee that gets you going in the right direction. Here, we highlight critical components of a content marketing campaign that’s going to go places. It’s been a hard day’s night this week, but it’s finally time for the Friday Fix! Lately, we’ve been talking about storytelling; this week, the virtues your parents tried to instill in you come up as winning content marketing strategies: be patient, work hard, be honest, and eat your vegetables. Okay, that last one is just because we want you to be healthy, but applying those other tried and true methods will help you get to the next level. 1964 the Tribute played to a Beatles-loving crowd at CMWorld in Cleveland, Ohio. The key notes to The Beatles’ success had less to do with yellow submarines and girls in the sky with diamonds as they did with sound strategies like: embracing your identity, taking it one day at a time, and working hard and often. Sajeel Qureshi’s advice on how to translate these approaches into content marketing is music to our ears. Just in case you missed this global event, Arnie Kuenn gives a detailed run-down of topical highlights and key note speakers’ strategies, which –unsurprisingly—include the importance and challenges of exciting and inspiring audiences through storytelling. A decade ago, aggressive, tricky tactics were employed to get consumers to click on a site, but we quickly learned that we were not the one-millionth visitor to a site and that we won nothing (a virus, perhaps, but nothing useful). In this article, Kimberly Grimms treats readers to no-tricks approaches on how psychology should be used to change consumer’s behavior in favor of their business. Aaron Agius shines a light on the mystery of why some campaigns sail into the sunset while others sputter and sink. By analyzing four different campaigns Agiusshares elements that will put wind in any campaign’s sails such as bringing in the pros for marketing materials like photos (no iPhone snaps, please). In this week’s Social Media Social Hour podcast, Tyler Anderson not only gives the play-by-play of Content Marketing World, he also –and more importantly—sits down with Simply Content Marketing founder, Laura Holloway for her clever take on Content Marketing World 2014 from the POV of a business owner and a conference freshman. Coming soon to a new dimension between sales and marketing near you: predictive marketing! In this must-read, Ashley Friedlein explains that if we can define what attributes look good for customers, then predictive marketing technologies can mine and use real-time data. The ideas are illustrated with an example of predictive marketing using a LinkedIn app (that we bet you’d love to make work for you). Your content marketing strategy may be fueled with best practices and have started in the fast lane, but if you find that you’re stalling or getting passed by the competition, you may be making one of the three critical errors Carrie Majewski highlights in this quick read. Have you ever ordered a glorious-sounding entrée only to discover none of the flavor profiles mentioned on the menu make it onto the plate? Like a good meal, your content marketing needs to serve people what they want / expect. In this article, David Dubois shows that by having an honest and informative menu, people leave satisfied and quickly come back for more. You’ve got a marketing strategy, and you want to see if it’s working, but what do you track? How much? Agh, so many questions! Hats off to Chris Lake for his awesome “Best Metrics Chart” of basic, engagement, positioning, and KPIs metrics. Okay, so we all know that there are essentials to a good content marketing strategy –organization, idea generation, promotion, and analysis. In this well-organized piece, Stacy Thompson shares 11 nifty tools that will make your life easier. According to Tom Carpenter, marketing has taken the backseat to content to the extent that content is being created for the sake of content. Tom proposes as flip to the status quo: calling it marketing with content provides five clever strategies for making marketing a priority to go along with that content.